It is not immediate what is meant by the term Calosoma. As a matter of fact, in order to define an appropriate term describing all the known species in an unambiguous way, it is necessary a quite long premise. Simplifying, we could start with the vision by Jeannel on systematic of Coleoptera and especially of Carabidae and more particularly of the group we are concerned about. According to Jeannel (1941), the Caraboidea (corresponding to Carabidae in the previous authors) should be divided into several families, one of which is the family Carabidae, including the subfamilies of Carabitae and Cychritae. Carabitae is then divided into the tribes of Calosomini and Carabini. According to another interpretation, firstly stated by Lindroth (1961-69), the family Carabidae (corresponding to Caraboidea of Jeannel) should be divided into several subfamilies, one of which is the subfamily Carabinae that includes the tribes Carabini, Cychrini, Pamborini, and Ceroglossini. In Carabini the subtribes Calosomina (correctly Calosomatina, according to the International Code of Zoological Nomenclature, 1999, art. 29.3.1) and Carabina can be included together, thus accentuating their interrelation, or, taking another point of view, the tribe Calosomini can be added to others as an additional one (Casale et al., 1982: 38). At the moment, the systematic interpretation that considers Calosomatina as a subtribe of Carabini appears the most acceptable, in the light of the results of the latest research findings. However, in a more radical vision, applied in the catalogue of Lorenz, 2005 but that not all the specialists seem to share, the subfamily Carabinae includes only the tribes of Carabini (with the subtribes Ceroglossina, Carabina) and Cychrini (with the subtribes Cychrina, Pamborina). In the subtribe Carabina are included together all the genera or subgenera previously included in Calosomatina and Carabina. When Jeannel (1940) was dealing with further subdivision within his Calosomini (= Calosomatina), he used a four ranks system: the first one unnamed and based on the characteristics of the ligula of the endophallus; following there were the phyletic series, the genus and the subgenus. In this way he identified 20 genera one of whom was Aplothorax that has been later attributed to a distinct tribe (Aplothoracini), by using larval morphology (Basilewsky 1972: 21), but that recently was again placed as a separate genus inside of Calosomatina, on the basis of phylogenetic considerations (Prüser and Mossakowski 1998: 300). 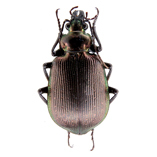 Gidaspow (1959: 231), as part of the American fauna, recognized only two genera: Calosoma and Callisthenes, maintaining the other genera of Jeannel as subgenera. 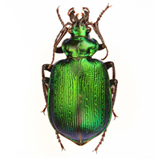 Lindroth (1961:42), dealing with the Canadian fauna, eliminated the subgenera of Calosoma, recognizing informal taxa designated as "species groups" that in part, coincide with the subgenera of previous authors. 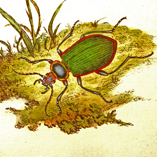 In the already cited catalogue of Lorenz (2005), inside Carabina, five separate genera are seen as valid: Calosoma, Calopachys, Carabops, Carabomorphus and Callisthenes. The same interpretation is followed in Fauna Europaea by Vigna Taglianti (2010). The system used by Jeannel (1940) has the great advantage to explicitly take into account the phylogenetic relationship (Ball, 2001: 66), even though some of his hypothesis have been partly undermined by the results of recent genetic studies. Indeed, those studies seem to indicate that all the division between genus and species of Calosomatina are phylogenetically equivalent and that their origin is much more recent than what had been hypothesized by Jeannel (Su et Al, 2005). In such circumstances, if one considers the usefulness of the Jeannel's system, but considering also that his genera are sometime difficult to defend on a pure morphological basis, it should be better maintaining the systematic of Calosomatina supported by the approach of Jeannel, but avoiding, in the same time, of accentuating the emphasis on phylogeny. Therefore his genera will be tackled as subgenera of the genus Calosoma, that in its turn is included in the subtribe Calosomatina (here we do not deal with the question of systematic position of Aplothorax). Therefore the subgenera of Calosoma we propose are based on the genera of Jeannel (1940) with a few changes that will be discussed on a case by case basis, and can be considered as homogenous groups at least from the morphological point of view and geographically well defined. The monophyly implicit in Jeannel's approach is however questioned by recent studies (Toussaint & Gillett, 2017) while they do not yet allow to define sufficiently robust phylogenetic alternative hypotheses. Concerning the species we take a more conservative approach, reducing drastically their number. In fact Jeannel, seventy years ago, recognized 138 species, and in the latest catalogue by Lorenz (2005), there are 168 species, 21 of which have been described after 1940 and the others resulting from the revaluation of previously described taxa. Here we have agreed on 128 species and we think that for most species it is not necessary to distinguish populations and therefore to establish any subspecific level (with few interesting exceptions), while, in some cases, the individual variability within a given population can be very striking .